Carbon composition resistors (CCR) are fixed form resistors. They are made out of fine carbon particles mixed with a binder (for example clay). After baking it has a solid form. Although carbon composition resistors are widely applied in circuits, the majority of resistors are nowadays made by deposition of a metal or carbon film over a ceramic carrier. The big advantage of carbon composition resistors is their ability to withstand high energy pulses. When current flows through the resistor, the entire carbon composition body conducts the energy. The wirewound resistor for example, has a much smaller volume of the wire to conduct. So the thermal mass of the carbon composition resistor is much higher, resulting in a higher energy capability. Carbon resistors can be made with a higher resistance than wirewound resistors, and are considerably cheaper. However, the properties are less good in terms of temperature coefficient, noise, voltage dependence and load. Fifty years ago, carbon composition resistors were widely used in consumer electronics. Because of the low stability of the resistance value, this type of resistor is not suitable for any modern high precision application. For example, the resistance value can change up to 5% over a shelf life of one year. With heavy use the value changes even more: up to 15% for a 2000h test at full rating with 70°C. Soldering can cause a 2% change. 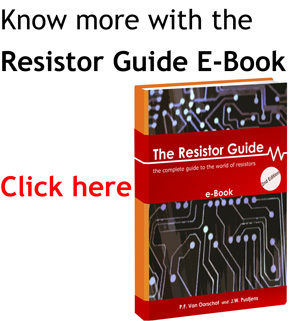 The reason for this instability is inherent to the design of the resistor. The carbon composition contains materials with different heat expansion properties. When the conducting carbon particles and the nonconducting binder heat up or cool down, stresses arise in the resistor body. The mechanical contact between the conducting particles will change, and this leads to a change in resistance value. Also noise properties are not good due to the mixture of different materials. The noise level increases when current flows. Resistors of 0.25W and 0.5W, have a maximum voltage of respectively 150V and 500V. Insulation resistance is poor with approximately 10^9 Ω (order of magnitude worse than other types). One more reason for the decrease in the use of this type of resistor, is the high temperature coefficient of around 1200 ppm/° C. The operating temperature range is between around -40 to 150 ° C. However, the resistor derate above 70 ° C.
Carbon composition resistors are suitable to withstand high energy pulses, while having a relatively small size. For this reason the carbon composition resistor is still used in many applications today. Applications include the protection of circuits (surge or discharge protection), current limiting, high voltage power supplies, high power or strobe lighting, and welding. An example of an application is a medical defibrillator. The sensitive measurement equipment attached to the patient, needs to be protected against the high energy pulses of around 30 Joule. Carbon composition resistors are applied in the equipment or the leads and have to withstand all pulse energy. The resistive material for the carbon composition resistor is a blend of graphite, ceramic dust and resin. The mixture is pressed into sticks under high pressure and temperature. The connecting wires are centrally pressed in both ends of the resistor. Alternatively, metal caps are fitted on both rod ends, which form the attachment for the wire leads. After the baking process a massive resistance body is created. Drawback of this process, is the difficulty to predetermine the resistance value. The resistor body is porous and therefore a coating is required. In the past some resistors were made without coating. The resistance value is established by varying the length of the carbon composition body, to create an adequate path for current. To vary the dissipation, resistors are made with different diameters to provide a large enough surface to dissipate heat. Commercial available carbon composition resistors have dissipation values between 1/8W and 1/4W, while in the 1980’s resistors where available up to 5W. Although many suppliers switched to producing other types of resistor, some suppliers are specialized in carbon composition resistors. In the table below the electrical resistivity is shown for the resistor material. The carbon composition resistor exists over hundred years. In the beginning of the twentieth century, the resistors were produced without coating. The lead wires were directly soldered onto the resistor body. The only available resistor types until the 1960s, were wirewound and carbon composition. In the 1960s and 70s there was a shift in use of carbon composition resistors to other types like the carbon or metal film resistor.